You don’t have to drive to the Caribbean to ride a horse along a paradisiac golden beach. Here's your chance to knock this adventure off your bucket list. This family-friendly ranch offers trail rides and horseback riding lessons suitable for ages, tastes, occasions and experience levels. 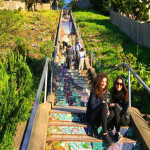 We will also drive you to Pacifica State Beach and old town, this is a popular destination for locals and surfers where you can have breakfast or enjoy a brunch before heading back to San Francisco to visit Alcatraz island. You Alcatraz prison tickets, ferry and horseback ride are all included. We added an extra hour to this adventure at no extra cost, so you enjoy a relaxing day and make this getaway a memorable journey for you. You don’t have to drive to the Caribbean to ride a horse along a paradisiac beach. Here's your chance to knock this adventure off your bucket list. This family-friendly ranch offers trail rides and horseback riding lessons suitable for ages and experience levels. After a complimentary pick-up at your hotel in San Francisco, you will depart south and cruise along California State Route 1, on the dramatic and rugged coastline of the Pacific Ocean to visit a family owned ranch of horseback riding at a historic stable, located just south of San Francisco and North of Half -Moon Bay. This is the only stable that offers direct access to a beautiful hidden beach accessible only on horseback through a canyon of rolling hills and wild flowers. It welcomes all levels of horseback riders – from beginners to experts. Meet-up with horse trainers, saddle up and embark on this thrilling horseback ride to enjoy a one-hour escorted ride, an amazing experience suitable for the whole family— even for first-time riders or beginners! No prior horseback riding experience is required, as you will be supervised by professional trainers. Your trainer will choose an appropriate horse for you, based on your experience, age, and weight and answer any questions you may have. Please provide the age and weight of each guest in the party for safety considerations. Safety is our number priority so please wear your helmet and be aware of the policies and safety guidelines. 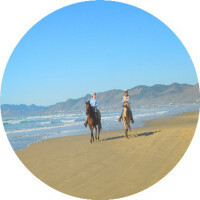 The simple act of getting up on a horse is magic and graceful, this excursion is perfect for those who wish to see this countryside unique beauty and ride a horse along the majestic Pacific Ocean coastline and enjoy the peacefulness of this remote beach inaccessible to all vehicles. We will also drive you to Pacifica State Beach and old town, this is a popular destination for locals and surfers where you can have breakfast or a brunch before heading back to San Francisco to visit Alcatraz island. Your Alcatraz prison tickets, ferry and horseback ride are all included. Depending on Alcatraz tickets available and the season, this trip may not be available unless both Alcatraz and the horseback rides are available, please book your private tour weeks and months in advance so we can assist you in the best way possible. -What to wear during excursion? You need to wear comfortable walking shoes with well-gripped soles. Dress in layers as the weather in Alcatraz, San Francisco and along the coast where you will ride the horse is rather cool, unpredictable, often foggy, windy and changes drastically in minutes. 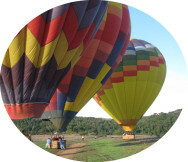 This new adventure may not be available for last-minute booking, in winter and during the rainy season or for any other considerations relating to weather and road conditions, we will simply refund or void your transaction when its not available. 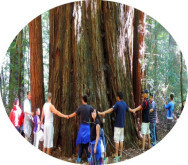 The first part of this new and custom tour: After a complimentary pick-up at your hotel in San Francisco, you will depart south and cruise along California State Route 1, on the dramatic and rugged coastline of the Pacific Ocean to visit a family owned ranch of horseback riding at historic stable, located just south of San Francisco and North of Half -Moon Bay. Meet-up with horse trainers, saddle up and embark on this thrilling horseback ride to enjoy a one-hour escorted ride, an amazing experience suitable for the whole family— even for first-time riders or beginners! No prior horseback riding experience is required, as you will be supervised by professional trainers. Depending on Alcatraz tickets available and the season, the trip itinerary may not be available unless both Alcatraz and the horseback rides are available, please book weeks and months in advance so we can assist you in the best way possible. The second part of your Alcatraz and horseback ride combo adventure will take you to legendary Island, also known as the ‘The Rock’. Your personal tour guide will drive you to the Alcatraz Ferry building, a terminal for Alcatraz ferries that provide transfers from San Francisco Bay to Alcatraz and return. This is the only ferry line allowed to access Alcatraz Island and it’s all included in the tour prices. These ferries and prison tickets are often sold months in advance, so the sooner you book, the better. -Depending on Alcatraz tickets available and the season, the trip itinerary may not be available unless both Alcatraz and the horseback rides are available, please book weeks and months in advance so we can assist you in the best way possible. What to wear during excursion? You need to wear comfortable walking shoes with well-gripped soles. Dress in layers as the weather in Alcatraz, San Francisco and along the coast where you will ride the horse is rather cool, incredible, often foggy and changes drastically in minutes. -Limited tickets available for visitors: Alcatraz tour tickets are sold out up to 10 weeks or more in advance during summers and holidays. Night tour tickets are even harder to get and are sold out as soon as they become available (available in summer only). We recommend that you secure your Alcatraz tickets at your earliest by booking it on our website. 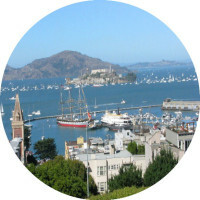 What’s Included in this Alcatraz adventure and Horseback ride tour? Complimentary pick-up in San Francisco downtown area or Fisherman’s wharf, all applicable taxes, parking fees, a one-hour horseback ride and drop-off at Alcatraz ferry in San Francisco. This is a 5-hour private custom tour instead of 4-hours. Alcatraz ferry and prison tickets and Alcatraz audio-guided tour are also included. 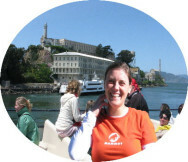 We help you with all other information regarding Alcatraz ferry and prison tour. You will be in very good hands. This worry-free combo tour worth every penny. We recommend staying at one of the famous Fisherman’s Wharf hotels so you can walk back from Alcatraz ferry terminal located few blocks away. Meals, your private tour guide and horseback trainer’s gratuity (gratuities are recommended and customary in the USA at 15%-20%), overtime and any extra activities fees. We do not drop you off at your hotel after Alcatraz - to keep the cost down and so you can enjoy the famous Fisherman’s Wharf area top attractions. Please be prepared for walking, cool/foggy and windy weather. The itinerary may change based on your time, road or weather conditions, pick-up location and preference. When it is rainy or foggy, we have to skip some areas/places for safety considerations or due to the lack of visibility. Advance reservations highly recommended especially during peak season, summer and weekends. Kids under 8 years old can ride a pony with a parent present. Horseback rider weight limit is 230 pounds.